Marble Contact Paper - Refresh your Furniture and your Life, it is that simple. This Marble Contact Paper will give your countertop an instant natural marble look. 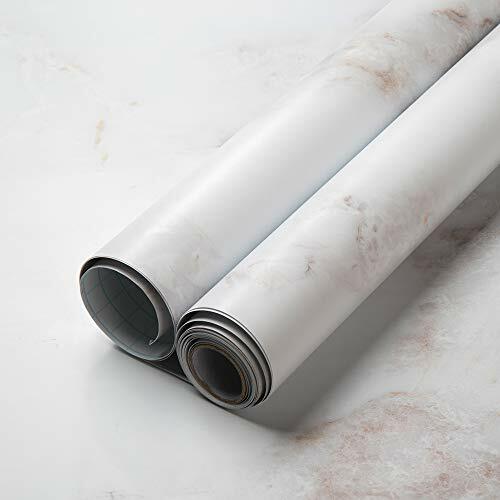 Why Homein Marble Contact Paper? 2.Easy to install, to maintain and clean. 3.100% toxic free PVC film, safe and durable for years. 4.Resistant to Oil, Dust, Water and will protect and decorate your furniture. 1.Clean the surface thoroughly and wait the surface DRY completely before the installation. 2.Cut the film to the desired size through the grid lines. And Please Leave 2-3cm margins each side for easy adjustment. 3.Starting from one size, peel off the backing gently whilst applying the film to the surface inch by inch (do not remove the entire backing at once). 4.When applying the film, use a cloth or a squeegee to remove the air bubbles and flatten out the film. 1.Do NOT apply the paper near an open fire, a hearth, or any other high-temperate areas. If you have any questions about this product by Homein, contact us by completing and submitting the form below. If you are looking for a specif part number, please include it with your message. RoomMates Blue Mosaic Peel and Stick Tile Backsplash, 4-pack 10.5" X 10.5"